Did you have a good Memorial Day weekend? I hope so! For ours, we did a lot of yard work and weeding, and I had plenty of exercise on tap leading up to Boise Ironman 70.3 in two weeks. 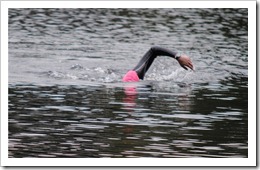 I finally got in an open water swim, which was very, very cold – the lake was 56* F! I’m now in the home stretch, and officially starting the “taper,” which means I get to reduce the length of my workouts from here on out. There are still plenty of sessions, they’re just shorter. 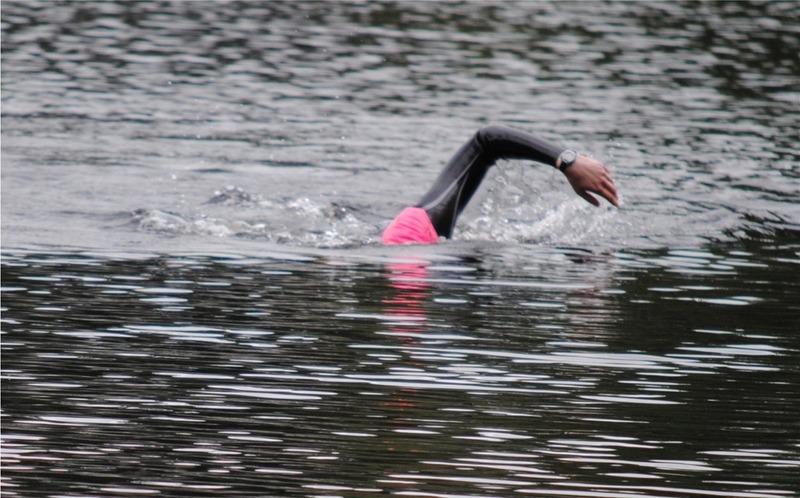 And, I’ll be visiting the lake quite a bit in these last two weeks – gotta get ready for the icy swim leg in the big race! 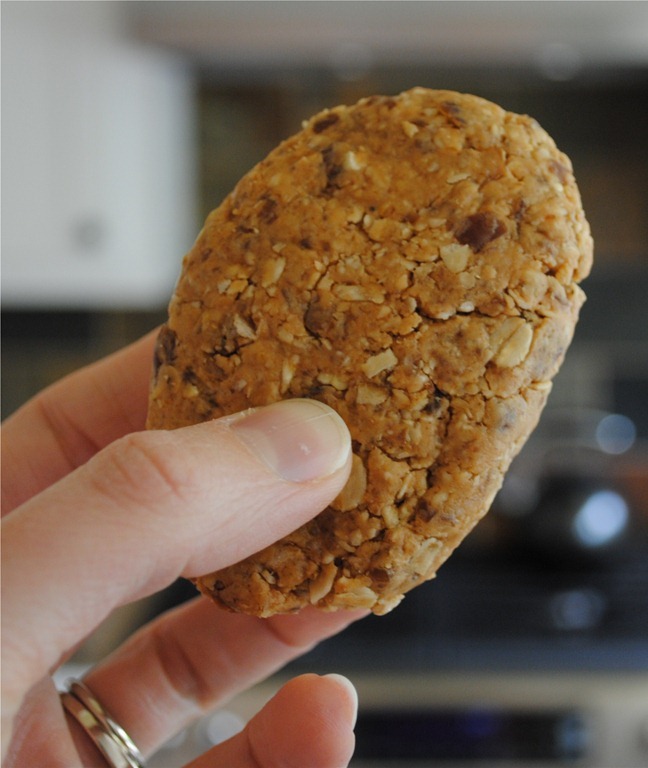 In the meantime, I concocted a new energy bar somewhat on accident. I had three jars of almost used up peanut butter (seriously, why??) 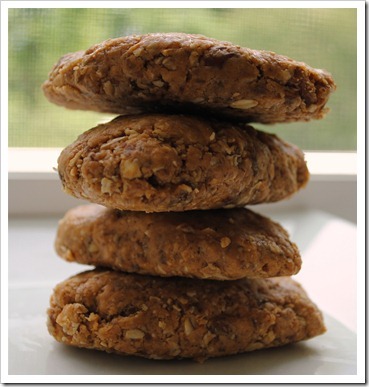 that I put to work with some oats and dates and it came out almost exactly like a peanut butter Clif Bar, but with just three ingredients. This made five bars, but of course I had to eat one to make sure it was good – and, it was hard to stop at just the one! Do you think steel-cut oats would also work? I’m trying these for the first time! I just got my Ninja blender and I’ve used it three times yesterday, twice today, so far!! It’s the best blender I’ve EVER had (in my 66 years) and absolutely LOVE it! I’m also enjoying your website! I don’t think steel cut oats would work here, since they’re a different texture than rolled oats, and really need to be cooked (in my opinion, anyway). If you don’t have oats, you could try oat bran or wheat germ. I just love my Ninja too – it really is the best kitchen appliance I have ever had! These look yummy! Can’t wait to try them. I’m confused do you cook the oats first? Or do you mix it with the peanut better then bake it? This is a “no bake” recipe. 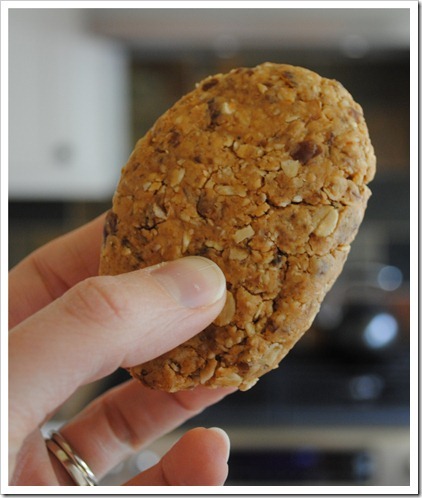 You add the uncooked oats and mix it all up, form into bars and refrigerate. No cooking required! Are you using fresh or dried dates in your recipes? I seem to be having a ridiculously difficult time finding fresh dates. Love the yummy recipes though. I usually use fresh, but dried will work too. You may need to soften up the dried ones by adding a bit (just a splash) of water to them and heating in the microwave for 30 seconds or so. Do you have a Trader Joe’s where you live? That is where I buy my dates – it is the cheapest and most reliable place to get the Medjools! Do you this these could be made in a big batch and then frozen? Yep! I think you are only limited by the volume of the blender. You are probably safe to double it, or make in separate batches if you want more. Then, I would freeze them in an airtight container in individual rows using a piece of wax paper between rows to keep them from sticking together. Then, take out and put in the fridge 2-3 days before you want to eat the frozen batch. I just got my ninja, and found your site and several articles that interested me. I made some peanut butter with my ninja, and them remembered your bars here, and had to try it. Came out pretty good, and I like how simple, fast, easy, and really no mess it was. Have you tried any other fruits other than dates? Was thinking about maybe adding some granola to the mix also. Glad you found some recipes that interest you! In terms of other things to add to the bars, I was using dates as the main binder for this particular recipe, which are kind of unique in terms of replacing. But, I think you could definitely add additional fruits to the mix, like dried cherries, blueberries, or cranberries and even other nuts or seeds. You could really use this as a base and customize it to whatever your tastes may be! Thanks for stopping by, Susan, and for your nice note. Glad to be of help! Do u think this would work with the ninja pulse? Excited for some bars! Yep, it absolutely will (in the 40 ounce jar). Enjoy! I recently received the Ninja Master prep pro,very disappointed that it did not come with a recipe book. Just found your blog and was wondering if you have done any recipes using this Ninja? You can use the Ninja Master Prep with pretty much all of my recipes. I don’t have any specific for just that blender, but the Ninja Recipes I have will work! I LOVE this recipe! I made it for my daughters’ 3rd grade class for their “before testing brain food snack!” They all LOVED IT! I even had the teacher asking me for the recipe. The only difference is that I rolled them onto little bite-sized balls. Thank you so much for ALL of your wonderful recipes……I’ve started using my Ninja almost every day because of your website! Thank you so much for letting me know! 🙂 Great idea to make them into kid-sized bites! Are you using homemmade peanut butter or a jarred peanut spread? I ask because my peanut butter has no oil, or anything other than peanuts. Do you think they would hold together the same? I don’t want to waste a batch of peant butter on a dry, crumbly experiment. Thanks! Really enjoying your site by the way. While I used store bought in this case, you could use either, honestly. The dates are the binder in this recipe and what holds it all together. As long as you blend it up pretty well, you should be good. 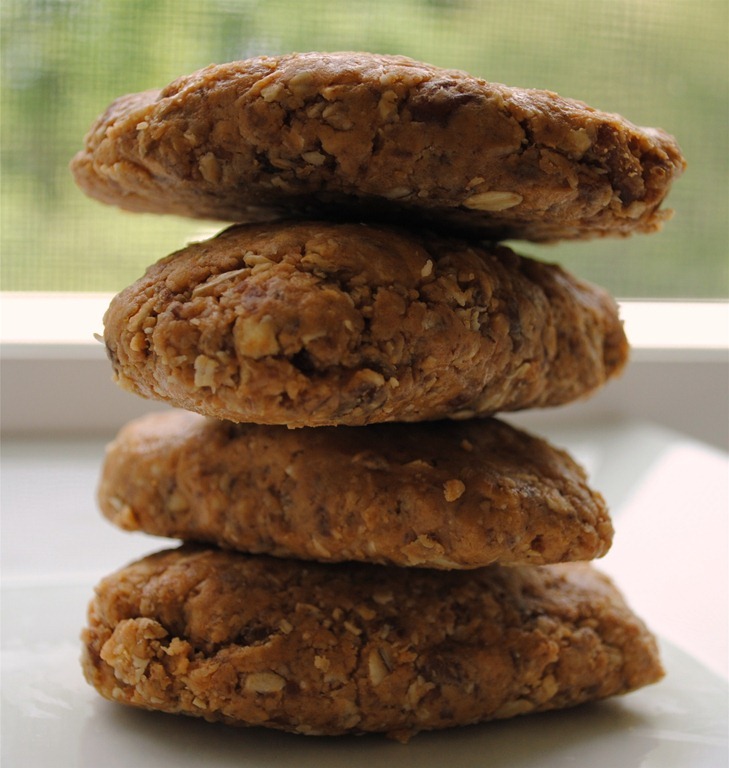 If it is too dry crumbly with your homemade PB, you can throw in an extra date or two.